Donald L. McMillen, 82, of DeSoto, KS, passed away on September 30, 2018. Don was born on March 17, 1936 in Chanute, KS. Don was active in Boy Scouts as a young man and achieved the rank of Eagle Scout. He attended Baker University and graduated from the University of Kansas where he received an Aeronautical Engineering Degree. 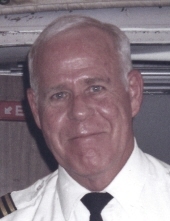 He was a veteran of the Vietnam War and served as a pilot in the United States Air Force. After discharge from the Air Force, he flew for Trans World Airlines and lived in St. Charles, MO. After retirement as a Captain from TWA, he moved to DeSoto, KS. Don met Nancy Mae Herold while at Baker University and they were married on April 20, 1957. He was an amazing father to his two sons, Scott and Tim. Don and his sons shared a passion for motocross when the boys were young, often travelling to compete. As adults, they spent hours engaging in long conversations about current news topics and life events. Don was an avid reader and a treasured grandfather to his 4 grandchildren. Don is survived by his wife Nancy; sons Scott (Rhonda) and Tim; sister Beverly McLaughlin; grandchildren Kristie, Nick, Kylie, and Cole; and numerous other relatives and friends. To plant a tree in memory of Donald L. McMillen, please visit our Tribute Store. "Email Address" would like to share the life celebration of Donald L. McMillen. Click on the "link" to go to share a favorite memory or leave a condolence message for the family.